If you’re a marketer on Amazon you know you need to know where the next winning product is coming from. That’s where all the profit is. This is the only product that will do the research for you. Save you invaluable hours in doing the impossible research and number crunching that’ll drive you crazy and take a lifetime if you have to do it manually. With this suite, you’re 10x as effective in selling. Spot the right offers, right angles and the right sourcing in minutes, and focus on what actually count - Selling & Profits! A whole new version of Viking with more powerful features than ever! Combo set of 6 best monetization software on amazon, works on windows operating system. Maximize your profit with the smartest Amazon product tracker! Get the full statistics on competitors’ sales on Amazon in 1 click! 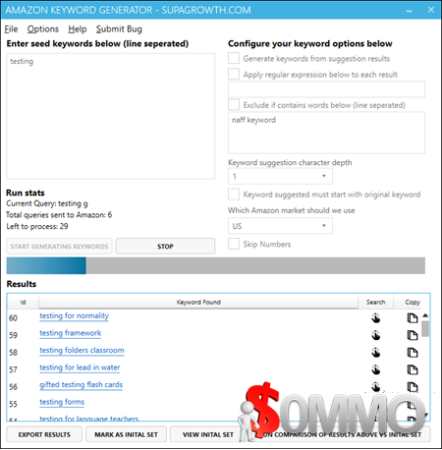 Amazon Keyword Tool is a keyword software tool that allows users to generate unlimited long tail keywords from Amazon auto search suggest. Amazon auto search suggest keywords are generated when an Amazon user enters any characters. For example if they enter cooking then a list of auto complete suggestions will be generated.